Five players competed in this weeks’ Shark-Free Challenge, our first tournament of the New year! The top seeds entering the tournament were Al Pinto and Evan Helman who both were looking to surpass the 1000 rating mark. Joining them were regulars Ellen Rosenfeld, Aidan Coimin and Aalok Bhattacharya who all were looking to put in strong performances. Everything was going as expected until the second round when Dream Teamer Bhattacharya defeated Coimin after the latter overlooked a forced checkmating sequence. The clash of the titans between Pinto and Helman saw Pinto win an exchange early and then convert it into a win despite the enormous pressure that Helman put on Pinto’s king’s position. 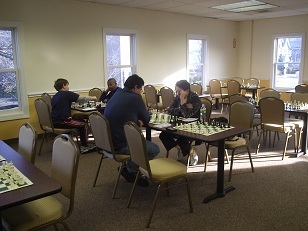 In the final round the two undefeated players (Pinto and Bhattacharya) faced off while Rosenfeld and Helman dueled for a chance at second place. In the end, the tournament favorites prevailed in both games. A special congratulations to Al Pinto for winning another tournament with a perfect score and crossing 1000 at a new all time high!